In March, Konecranes was selected to supply two Konecranes Gottwald Model 5 mobile harbor cranes for the Port of Dover’s new cargo facilities as part of the Dover Western Docks Revival (DWDR) development. 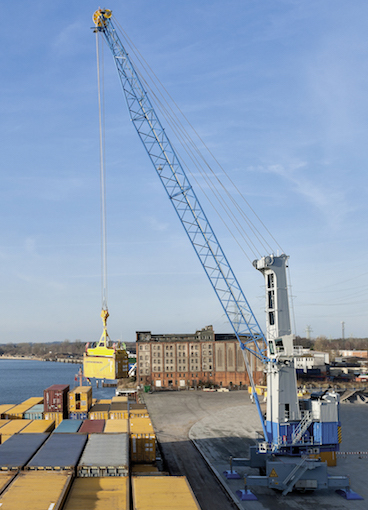 The Model 5 mobile harbor cranes, which have a maximum lifting capacity of 125 t and an outreach of up to 51 m, operate with a hybrid drive technology that reduces fuel consumption and exhaust emissions while reducing noise pollution at the port. They will be used to handle mainly containers and palletised fruit on the new multi-purpose refrigerated cargo terminal, which is scheduled to open in the first quarter of 2019. The DWDR is the largest single investment ever made by the Port of Dover and will ultimately be a very important instrument to cope with the constant increase in port traffic in the UK.